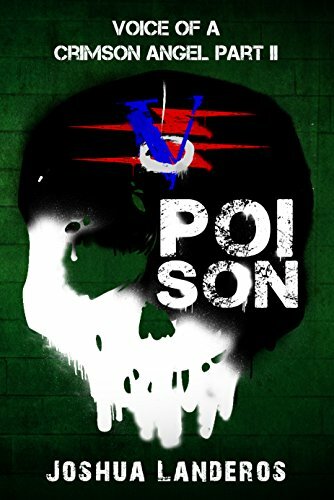 Joshua Landeros is at it again with a sequel to his prequel series with Voice of the Crimson Angel Part II: Poison. Julissa Marconi is ready to take on the ultimate villain, Chancellor Venloran. All that stands between the United Nation Republic and Mexico is the rebels, who seek to resist the tyrannical influence of the more powerful country. This struggle will not end cleanly as Venloran deploys his cyborg soldiers, which leaves Julissa questioning if she can really stop this assault. She may have to become what she fights. And once again Landeros hits it out of the park with this novel and there is a maturing of his prose in a way that should greatly satisfy his readers. Poison centers around the conflict, or rather, Expansion, that the United Nation Republic is forcing upon Mexico. There is a resonance here with the current events of immigration and Mexico with the US, which does not make this seem like an accident on Landeros’ part. The engagement not only of the struggle of soldiers, but of entire populaces, bumps up the stakes of what has been up until now, a waltz down memory lane to contextualize his main Reverence series. This installment breathes new air into the series and gives the prequel series more weight going forward. In some ways the look at the national conflict tends to make the conflict become too political and the characters are lost in the back and forth, but it eventually re-centers and the story becomes an intimate tale about identity and duty. The style of Landeros is largely unchanged aside from his deeper engagement with thematic elements helping his subtle prose along. Robert Heinlein would be proud as would Atwood with his struggle to both dignify the society he has created, and draw parallels from our world to the world of Reverence. For the science fiction reader, there may be more thriller, political drama than one is used to, but we can always count on Landeros to bring the fight to us. In the grander scheme of his series and world building, Posion begins to show the end game that will follow, since the Expansion is only a piece to Venloran’s ongoing long game. We all know the players who are involved at this point and it’s really just seeing it all unravel. Truly, a pulse-pounding thrilling read. Posted on June 18, 2018, in Book Reviews, Five Stars and tagged alibris, atwood, author, author life, authors, barnes and noble, book, book club, book geek, book lover, bookaholic, bookbaby, bookblogger, bookbub, bookhaul, bookhub, bookish, bookreads, books of instagram, booksbooksbooks, bookshelf, bookstagram, bookstagramer, bookwitty, bookworks, bookworm, drama, dystopia, ebook, espionage, fantasy, fiction, future, goodreads, ilovebooks, indiebooks, joshua landeros, kindle, kobo, literature, mexico, military, nook, novel, poison, politics, post apolcalyptic, publishing, read, reader, reading, republic, robert heinlein, science fiction, scifi, shelfari, smashwords, society, soldier, story, suspense, thriller, tyranny, united nations, Voice of a Crimson Angel, war, writer, writer community, writing. Bookmark the permalink. Leave a comment.